Media must rebuild its business around relevance and value, not volume. In mass media, we have debated for generations whether content or distribution is king. Turns out neither is. There is no king. Instead, the kingdom is ruled by the relationships among its citizens. Relationships, of course, fuel Facebook’s empire as it connects people with each other. 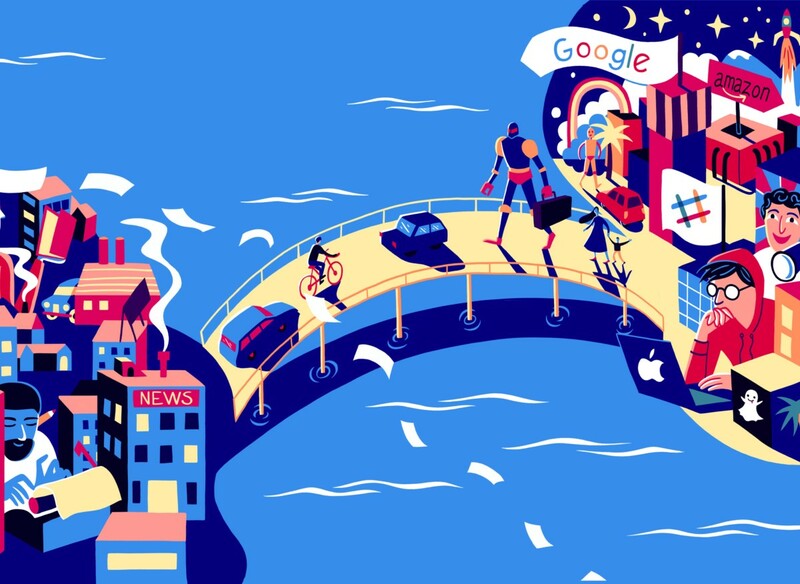 Relationships inform Google as it uses what it knows about each of us to deliver greater relevance in everything from search results to email prioritization to maps. Each of these giants knows every one of us as an individual. Each is a personal services company. Not the news business. We still treat the public we serve as a mass, all the same, delivering a one-way, one-size-fits-all product that we fill with a commodity we call content. What has died thanks to the abundance and choice the internet enables is not print or newsstands, longform or broadcast. What has died is the mass-media business model — injuring, perhaps mortally, a host of institutions it symbiotically supported: publishing, broadcasting, mass marketing, mass production, political parties, possibly even our notion of a nation. We are coming at last to the end of the Gutenberg Age. Rather than continuing to try to maintain our content factory, whose real business is selling eyeballs by the ton, imagine instead if news were a service whose aim is to help people improve their lives and communities by connecting them not only to information, but also to each other, with a commercial model built on value over volume. Imagine if news understood its role not as a vertically integrated industry that owns and controls a scarcity — the printing press, the broadcast tower, delivery trucks, the audience, space or time in media, and lately attention — but rather as a member of the community it serves and as a player in a larger, complex ecosystem of information, data, technology, and relationships. Imagine all the ways that technology enables us to realize our true mission of informing communities, far beyond what we could do with our old, one-way, one-size-fits-all mass media of print and broadcast. If we are to reimagine news as such a service — built on relationships and thus relevance and value — then it is necessary to reconsider many of our fundamental assumptions about our business: that we manufacture a product filled with content; that our core competence is distribution to audiences; that audiences must come to us to consume our content; that the public is as nostalgic as we are for our old media of print and broadcast; and that we have a proprietary hold on trust and authority. We also cannot continue to act like the proprietors of monopolies and oligopolies, believing that we can go it alone and don’t need to collaborate with the new entrants, like Facebook and Google, which we would like to think stole the audience and ad revenue that once belonged to us. Get over it. We all know the fate of Gutenberg’s invention. I have nothing against print, just as I have nothing against horses as a means of transportation or telephones as a means of talking, but we cannot hold onto an unsustainable technological artifact out of romanticism. I have been among those who argue that news must become digital first. To the companies I work with I offer a simple definition of that buzzphrase: A legacy news company must become a fully sustainable (read: profitable) digital enterprise before the date at which print becomes unsustainable. And that date is…? Sooner than we wish to think. Digital — not just new media tools, but, more specifically, the internet — enables us to build a kind and quality of journalism that simply was not possible in old media. What makes the net new and valuable is that it enables relationships. My belief in a relationship strategy for news — which I explored in my book Geeks Bearing Gifts: Imagining New Futures for News — inspired the creation of a new Master’s degree in Social Journalism at the City University of New York Graduate School of Journalism, where I teach and direct the Tow-Knight Center for Entrepreneurial Journalism. In that program, my colleague, Dr. Carrie Brown, and I direct our students to select communities that identify themselves as communities (that is: not fake, demographic labels like “millennials”) and then to observe and learn to listen, so they can discern the problems and goals these people share. Then and only then can we, the journalists, bring our tools to bear to help them. Thus the ability to build new products and services around communities becomes a central skill of the new news company. Witness how Vox, Quartz, BuzzFeed, and other successful newcomers have put product development at the heart of their organizations. At CUNY, we recently convened more than a dozen of the best product chiefs in the business — from the three companies I just listed and from legacy forebears including The Guardian, The New York Times, and The Washington Post. The newcomers no longer manage silos in industrial organizations — editorial on this floor, commercial on that floor, technology behind that door. They run small, cross-functional teams that include the necessary constituents — product (formerly known as editorial), audience (though I loathe that term for its implied passivity and consumption), commercial (that is, revenue), technology (no, every journalist will not become a coder — the elusive hack-hacker), design (not just of presentation but of use), and data. These teams need to be empowered to identify a customer need and build a product to meet it. Many new skills and jobs are required in these remade organizational structures: the ability to observe, listen to, and empathize with a community; the ability to use new products to generate data about users so we can serve them with greater relevance; the ability to maintain user profiles at an individual level and analyze and act on the data there. In our meeting with product development people, I also heard interest in a new job responsibility: user advocate (though I could argue that should be the job of an editor). Communities: These can, of course, be geographic: serving a town or neighborhood. There are many other communities to consider: the retired, small-business owners, ethnic diasporas, parents of small children, addicts, activists, teachers, lesbian women, gay men, divorcees and on ad infinitum. Beware mere demographics — I have less in common with people who look like me than pollsters and marketers would lead us to believe, and making a product or service for a statistical grouping risks patronizing them (“what do women want?”). Beware the false community, defined externally, such as millennials or American Hispanics (who are actually comprised of many diasporas). And beware the brand and the belief that people who happen to buy our product are members of a community we define around us. Find communities that are self-defined and underserved and learn how to serve them better. Interests: Almost all communities are, in the conception of Benedict Anderson, imagined communities — that is, groups of people who likely have not met but who gather around a common need or desire. Even if I do not know other cancer patients and might not consider myself a member of a cancer community, it is clear that I share information needs with others in my situation. There is, of course, no scarcity of interests that can be served: football team fans, environmentalists, crafters, foodies, people selling homes, people buying homes, job-seekers, cat owners, dog owners (look at Meetup.com and see just how specific this can become — say, pug owners). Beware thinking that people organize their interests around our newsroom taxonomy: news, life, business, sport. Also understand that topics are not necessarily interests. Google News head Richard Gingras likes to use this example: He was fascinated by the story of former New York Congressman Anthony Weiner — famous for exposing public pictures of his private parts — not because Gingras was interested in New York politics or Weiner’s genitalia, but because he cannot resist the story of a fall from grace. Interests must be defined not in newsroom terms — the content we happen to have, the way we assign and organize our organization — but instead in the terms of the interested. Use cases: In Geeks Bearing Gifts, I argued that mobile forces us to imagine and serve the many different use cases of news, just as mobile required Facebook to build or buy services for different use cases of social connection — Facebook for organizing friends’ information; WhatsApp and Messenger for communicating with them; Instagram for sharing moments. We should consider the use cases of news: waking up and wanting a quick view of what’s happened (the home page is a rather poor answer to this need); following and receiving alerts on stories that matter to us; getting background on a story (Wikipedia has fulfilled that function and now Vox is trying to make a business of it); connecting with members of our communities to talk or take action. So long as we still print a newspaper, we also should reconsider its use case: Do people truly still need a product that tells them what happened yesterday, which they likely already know? Thus the new news organization produces a constellation of services giving groups of people what they need. How does it make money? The industry is exploring various new revenue streams. None will be our singular savior (so far, tablets, paywalls, and native advertising have all turned out to be false messiahs). At CUNY, I am trying to help public media in the United States and The Guardian on extending models of membership and public support of journalism, which is the logical extension of a relationship strategy. Some enterprises — notably Texas Tribune — are earning revenue and enhancing relationships through events. Schibsted, Springer — and someday soon, I presume, Jeff Bezos’ Washington Post — are turning their promotional power and their user data into e-commerce opportunities. And advertising? Just as we know the eventual fate of print, we know where the commoditization of advertising through abundance, programmatic, and retargeting leads: downward. Yet media must still depend on advertising, for there is not enough money from the generosity of the public, foundations, government (God help us), or commerce partners to support even more efficient visions of our work. And we can rest assured that it will take generations — if ever — before brands and marketers themselves learn that they, too, can build direct relationships of relevance and value with their customers, bypassing marketing expense. The question is whether we can sell marketers something of greater value. I hope we can sell them a skill. Consider that BuzzFeed doesn’t really sell media space and time as legacy companies do. BuzzFeed sells a skill: “We know how to make our stuff viral so we can make your stuff viral, too.” Vice, similarly, sells its talent at making stuff cool. News organizations should demonstrate that they know how to serve communities with trust and relevance — and then offer that skill to other companies that wish to do that themselves. We can do that as consultants. We can create products that serve, say, beer fans, giving them information, convening their communities, and — this is an idea from one of our Social Journalism students — organizing brewery tours. We can become service organizations that end up competing with public relationships agencies, which I argue need to flip themselves on the head and become the representatives of the public to the company rather than of the company to the public. All that is challenging enough to imagine and accomplish. But, of course, the net being the net, life gets only more complicated. Building relationships is made even more difficult on the distributed net, which forces us to interact with the public we serve everywhere except on our sites. Suddenly, not only is our content less valuable, but so is our distribution. Of the five billion interactions BuzzFeed has with its public each month, only one billion occur at BuzzFeed.com; the rest occur on Facebook, YouTube, Instagram, Snapchat, and platforms yet to be invented. In this latest structure of the net, our web sites are no longer destinations. Neither is content itself. Last year, I attended VidCon — the Comic-Con of YouTube — where I learned that in young people’s lives, content is not a product to be consumed. For them, content is a social token that feeds their conversations. That is, when my daughter sends her friend a video, she is not recommending this as content her friend should stop and consume. Rather, she is using this media to say something about her or her friend or their relationship. She is saying about a video: “This speaks for me.” Or: “I get the joke.” If we follow this notion to its logical conclusion, content is no longer a product or a destination — and perhaps no longer a brand — but merely a cog in someone else’s conversation. Content is not king. Distribution is not king. Conversation is the kingdom. I believe we have no choice but to distribute what we do as widely as we can. How can we still presume to force people to come to our sites when our content can travel to them? The good news is that with Instant Articles and AMP, content can travel with business model attached. The bad news is that in an era when first-party data is a prerequisite to building relationships with people, Facebook and Google know more about our users than we do. So we need to negotiate with them to get interest data about our users and usage data about our content. When I say this to publishers, I hear them protest that Facebook and Google would never give up data. But have we asked? And when I say this to the platforms, they say that publishers wouldn’t know what to do with the data if they had it. Are the platforms wrong? Today, they probably are. But Google and Facebook could teach the news industry how to better build and serve relationships. Why would they help us? First, European publishers — particularly in Germany — declared war on Google, spending their political clout to pass protectionist copyright laws. Google responded with its Digital News Initiative. Silicon Valley needs friends in our industry. Second, it is in the interests of both platforms and publishers to create means and standards for the transfer of first-party data about users in ways that serve and protect users’ interests and privacy — before regulators kill our chances to do this. Third — and least cynically — I believe the platforms are sincere when they pay tribute to the value of news and say they care about its future. I will even go so far as to say that we in the news business should look at building some products and services for specific communities entirely on the platforms — e.g., service to a community of interest on Facebook; news services on YouTube; alerts via Twitter, Snapchat, and WhatsApp; convening communities of customers via Slack. The platforms, in turn, would be wise to help us, thereby building business, soothing regulators, and better serving their users. There is no God-given law that says we in media are entitled to control every aspect of the news business — content creation to production, distribution to sales — just because we used to. Indeed, perhaps we should give up functions that are no longer core to our mission — the digital equivalents of running presses and driving trucks — so we can concentrate on building our true value around trusted information. In the network economy, vertically integrated industries are being replaced by ecosystems and we must learn to collaborate so that we may prosper within them. It is not sufficient for journalists to complain that they don’t trust the technologists and refuse to play with them. To do that is to abandon the public we vow to serve who use and get their news via their platforms; we must go to them there. We need to find areas of mutual benefit with the platforms — serving more people with higher quality information and greater engagement and negotiating around issues of value (advertising opportunities and shares), relationships (we need interest data from the platforms so we can serve our users better), and terms (yes, we fear the platforms changing the deal in the future, but we can also negotiate with the awareness that the last thing Silicon Valley technology companies need — especially in Europe — is enemies in the news business). We need peace in the kingdom. Because of that belief, I spend a good deal of my time talking with publishers and platforms about each other. I still see a considerable gap of understanding between them, breeding unnecessary distrust. Of course, all these companies will act in their own interests; they are companies. The journalistic skill most useful in business negotiations is skepticism. But it is in the interests of all parties to understand each other and work together. To accomplish that, I believe the industries need cross-pollination. Perhaps the greatest benefit of Google’s Digital News Initiative and its Newsgeist events is that each side learns more about the other. At our next convening of product development executives in news, we will invite product (sorry: not business development) people from platforms so they can dig into specifics on small matters (e.g., Facebook and Google treat a news organization’s desire to update the news differently) and large (can we begin to build standards for data exchange?). News companies are desperate to hire technologists. I also suggest that the platforms would be well-served to hire senior journalists — just a few — not to build competitive news operations (who wants to go into that business?) but to act as translators between our cultures and, more importantly, to help the platforms better serve their own users. That is what we all want to do. None of us are kings. We are all merely servants of the public.